With huge spikes in iPhone and iPad sales, developers and designers are naturally concerned about the lack of typography these devices afford. 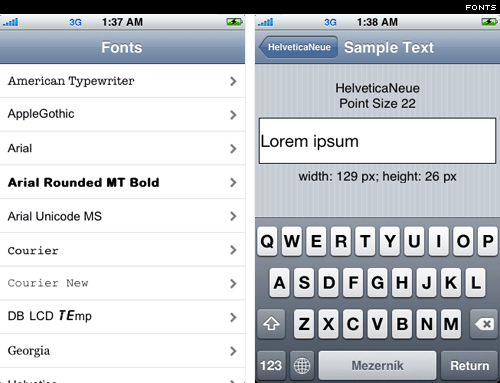 When the much anticipated iPad was launched in April 2010, we were dismayed to find only a few font options. And while they’ve come a long way in a short time, if these devices are going to accommodate the creative expectations of designers and consumers, they’re going to have to step up their iOS font support. It’s curious that a visually oriented company like Apple offers such anemic font control on these devices. Function trumps form, and while the company’s intention to keep tight control over its interface is understandable, it is also a bit disappointing. Creatives flock to Apple for its easy interface, its intuitive design, its streamlined structure. Unfortunately, developers and designers aren’t able to fully capitalize on these functions because of limited choices. It’s a bit like being admitted to Disneyworld, and then being told you can only use the kiddy rides. What’s the point of having an innovative and powerful device that limits your viewing experience? This contest between device and web design is an interesting one. Can creatives – Apple’s primary customer base – learn to be happy with the limitations? Or will the company be forced to expand its iOS font technologies? Typography is critical to the user’s experience. Over time, technological breakthroughs in deliverable typefaces will be a game-changer, forcing even the most powerful mobile providers to give their customers an added measure of freedom. It’s just a matter of time. This entry was posted on February 24, 2011, 3:28 pm and is filed under Font Related, Software, Technical, Technology. You can follow any responses to this entry through RSS 2.0. You can leave a response, or trackback from your own site.